DEBONE THE TURKEY: Debone the turkey according to the video instructions. A few tips to ensure success is A) Sharpen your pairing knife before you start. B) Go slow. There's no rush. Make sure that you do not puncture or tear the skins during the process. 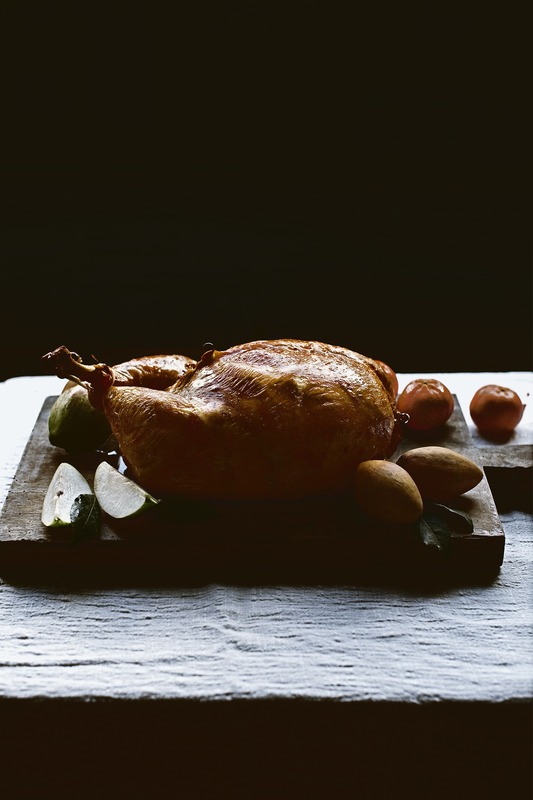 The skins act as a "bag", containing all the juices inside during roasting. Small tears can be fixed with toothpicks, but large ones can be unsightly. C) Don't fret. This is not rocket science. 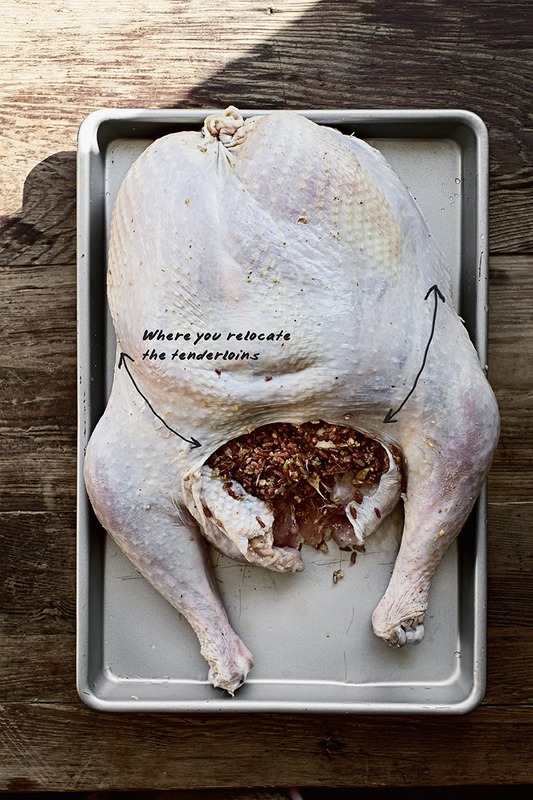 After deboning the turkey, mix together kosher salt, galangal powder, ground white pepper and sugar, then evenly rub it on the turkey, both inside and out. 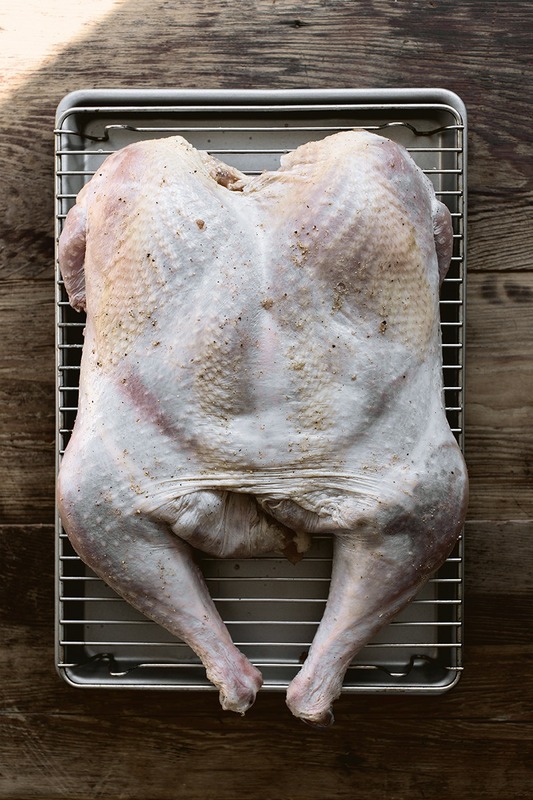 Lay the turkey flat, breast-side up, on a baking rack set on top of a baking sheet. Tuck exposed meats into and under the skin so they are protected from drying, then place inside the fridge uncovered, for overnight to 24 hours. The skins will air-dry, making them crispier after roasting. 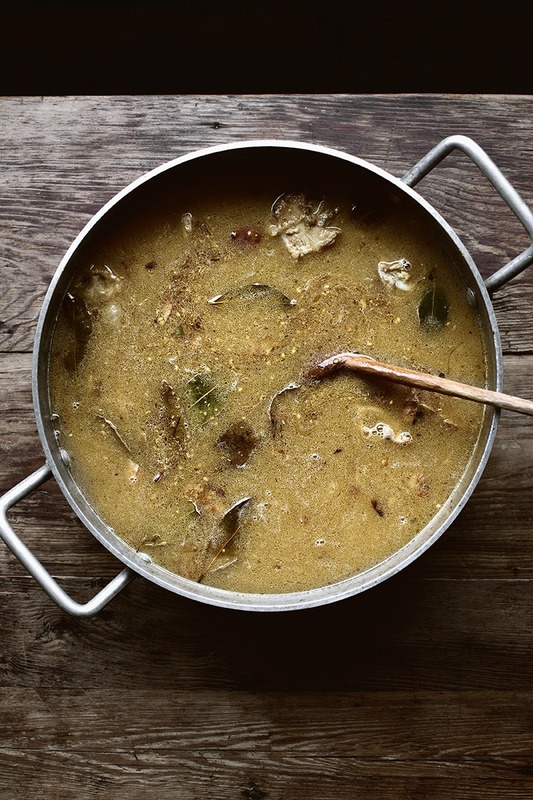 PREPARE TURKEY BROTH FOR GRAVY: Chop all the bone scraps and innards into large chunks. In a large wide pot, heat canola oil over high heat. Cook the scraps until there is deep caramelization around the scraps and on the bottom of the pot, about 8~10 minutes. Add unsalted butter, onion, garlics, bay leaves, sea salt, Sichuan peppercorns, coriander, cumin and cardamon, and cook until the onions and garlics are lightly browned. 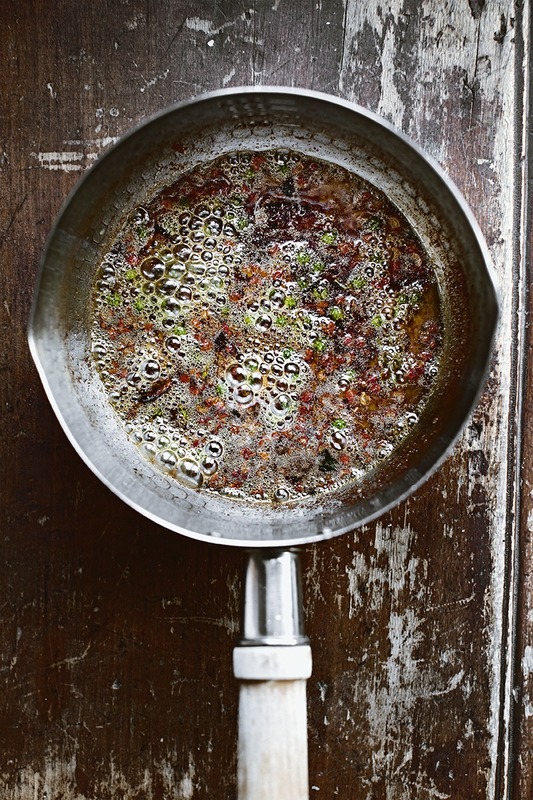 Add Brandy or Cognac and cook for 30 seconds, then add low-sodium chicken broth, water and fish sauce. Put the lid on and turn the heat to medium-low, maintaining it at a gentle boil (more active than simmering), and cook for 3 hours (or 1 1/2 hour in pressure cooker). 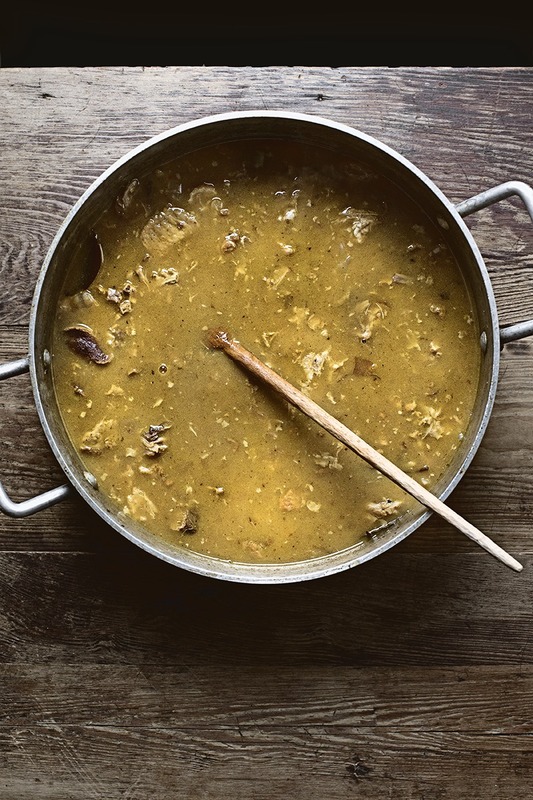 During which, use a tongs to break up the scraps and meats, releasing as much flavors into the broth as possible. The broth should be reduced down to about 60~50%. If it's reducing too fast, just add more water or chicken broth. When done, strain the broth through an extra fine sieve, pressing on the solids to extract as much liquid as you can, then discard the solids. Keep the broth covered and refrigerated until needed. 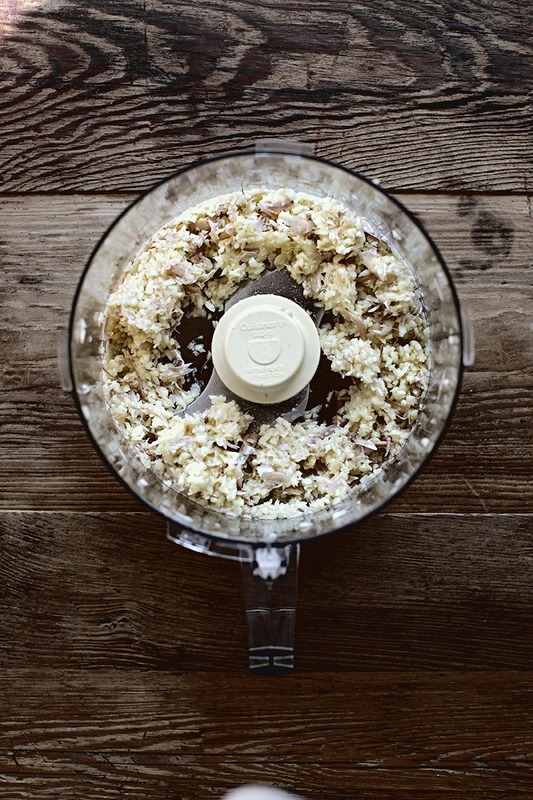 PREPARE STUFFINGS: Break the garlic heads into individual cloves then place into the food-processor unpeeled (I know it sounds nuts but trust me, peeling is unnecessary). Add fish sauce, then pulse until the garlics are finely chopped. 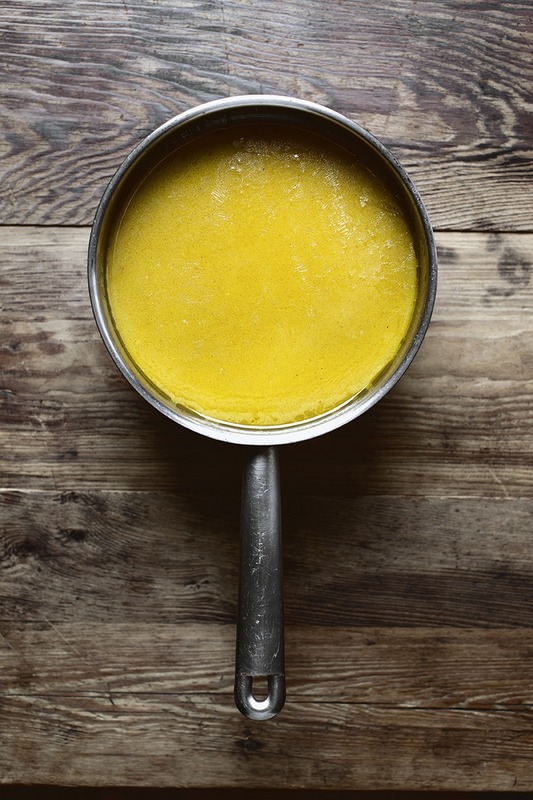 Transfer into a non-stick pot, then add canola oil and set on medium-low heat. Meanwhile, set a fine sieve over a large bowl on the side. 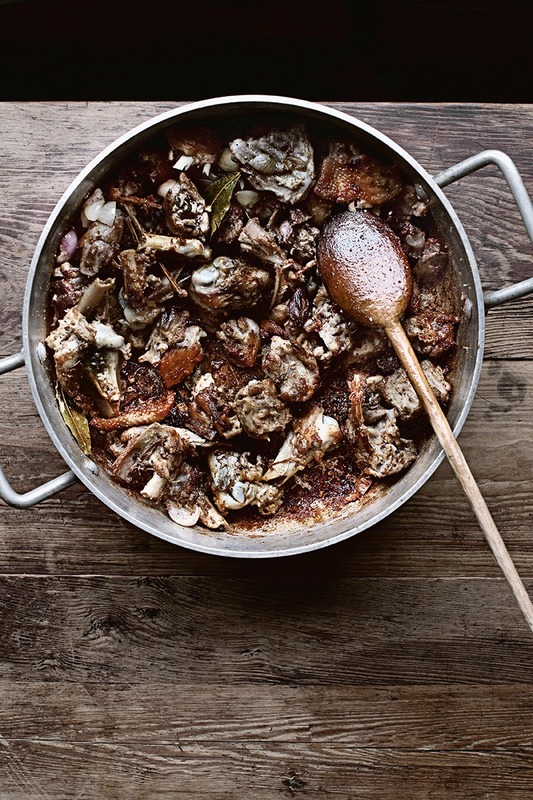 Stirring frequently if not constantly, and fry until the garlics are light brown in color, about 10 min. 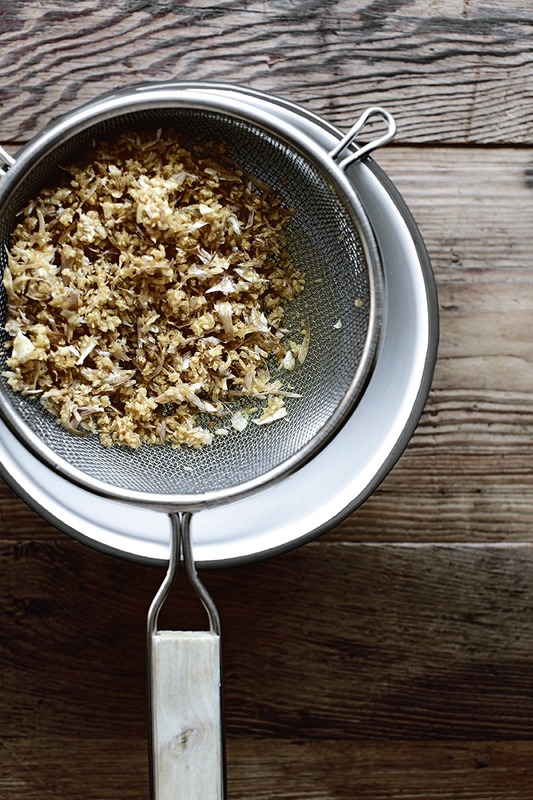 Immediately strain the garlics through the fine sieve, and reserve the oil. The garlic will continue to darken a bit in color and crisp up. Cook them any longer they will become bitter. 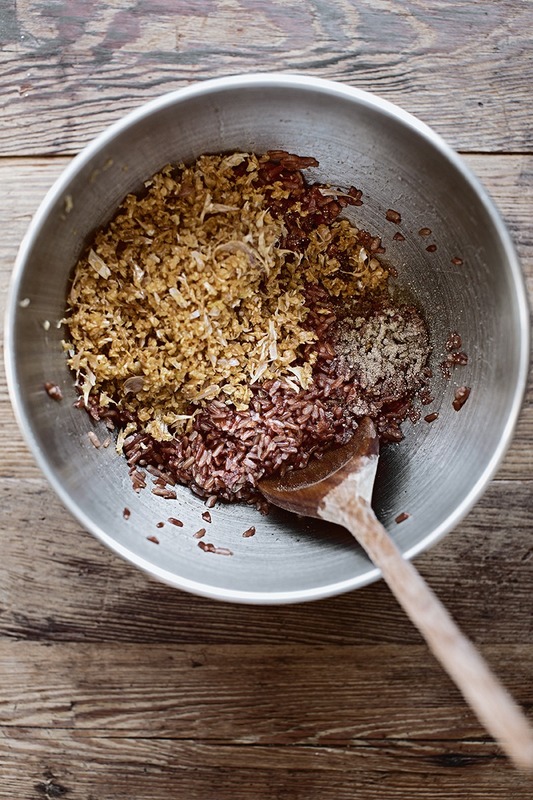 In a large bowl, evenly mix the fried garlics, 2 tbsp of the garlic oil, cooked wild rice, 1/4 cup of the turkey broth, 1 1/2 tsp fish sauce and ground white pepper. You can mix in some chopped tarragon or chives if available. Cover and leave in the fridge until needed. Cook eggs in simmering water for 6:30 minutes. Rinse in cold water to cool, then leave in the fridge unpeeled, until needed. STUFF AND SEAL THE TURKEY: Preheat the oven on 400 F/200 C, fan-on if available. Warm the rice-stuffing in microwave just so it's not cold. Remove the turkey from the fridge and pat any excess moisture dry. 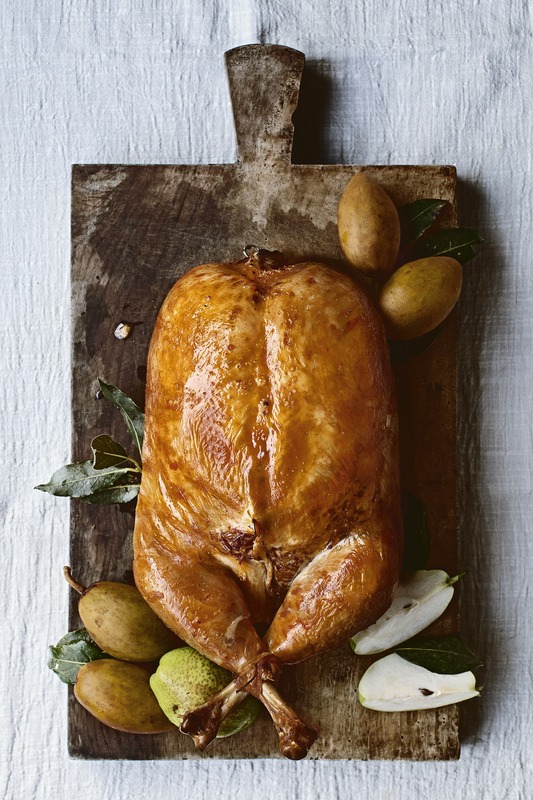 With a wooden or metal skewer, sew the skins around neck-opening together (leave a good margin so the seam won't burst during roasting), then tuck both wing-drumsticks into the body. Remove and relocate the tenderloins (it may have already detached during deboning) right in-between the thigh and the breast, where the skins are the thinnest (see photo). Intermittently stuff the rice-stuffings and soft-boiled eggs into the turkey cavity until it's about 90% full. The turkey will shrink during roasting. Stuffing it too full will cause the skins to tear. Sew the cavity-opening together with more wooden or metal skewers. With kitchen strings, tie the ends of drumsticks tightly together, then circle the string around the thigh areas and tie them just so the drumsticks are not parting too widely apart. Insert a thermometer into the inner thigh through the cavity opening (see photo). Use a shallow roasting pan. 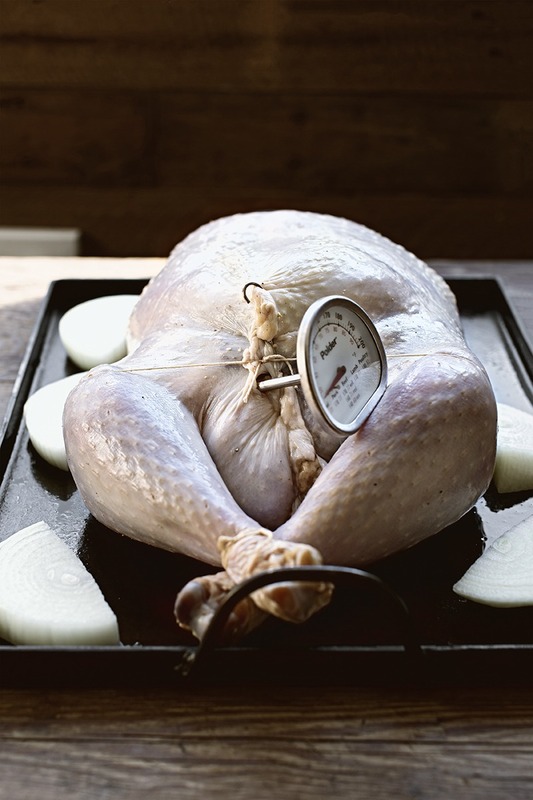 We don't want a deep roasting pan because we want as much air circulation around the turkey as possible. Heat the pan over medium-high heat on the stove, and brush it with the reserved garlic oil. Place the turkey in the center of the pan, breast-side up, and scatter a few onion wedges around the pan (to prevent smoking up). Once the bottom of the turkey seems to start to brown, transfer the pan into the lower-rack of the oven. Rotate the pan 90 degrees every 20 minutes. Roast for about 1 hour, until the thermometer reads 158 F/70 C. The internal temperature will continue to rise during resting, to 167 F/75 C which is the ideal doneness. In the last 20 minutes during roasting, if you feel that the internal temperature is closing in but the skins aren't browning enough, then turn up the oven to 450 F/230 C. Or if the skins are browning too fast but the internal temperature isn't catching up, then lower the oven to 355 F/180 C. Same instruction for bigger turkeys. 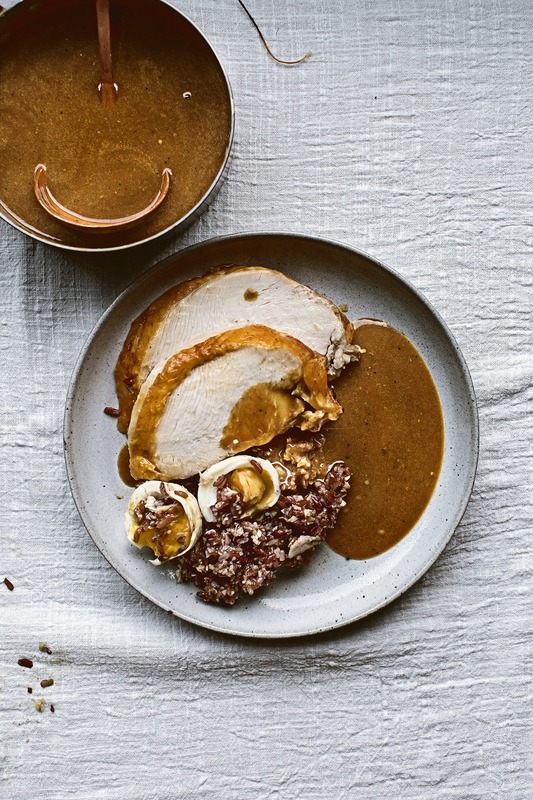 FINISH THE GRAVY: 20 minutes before the turkey is done, bring the turkey broth back to a simmer. 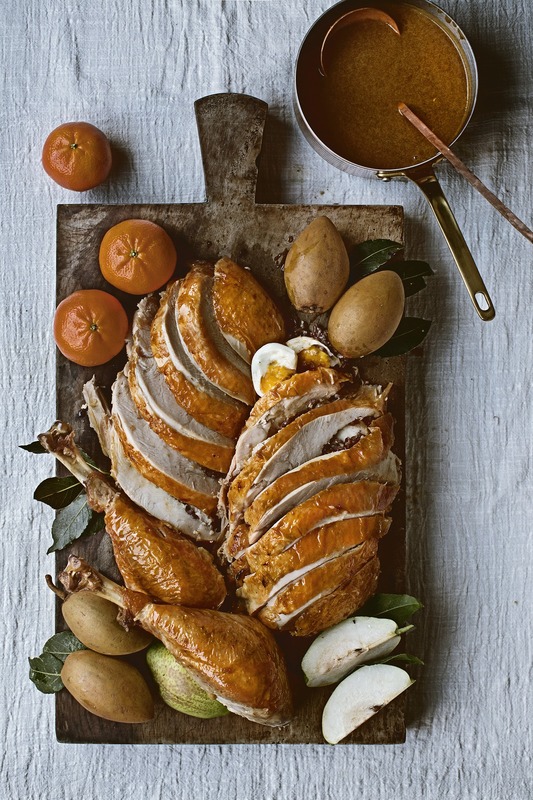 Once the turkey is ready, transfer it onto the serving plate, uncovered, and let rest for 15~20 minutes (if there are pale spots, finish it with a blow-torch). Keep the thermometers inside. 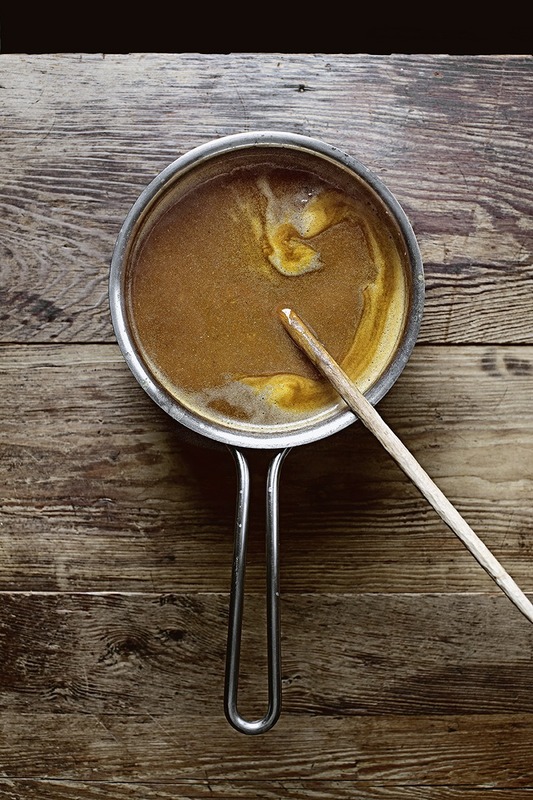 Meanwhile, skim the layer of fat on the surface of the broth into a smaller pot, and scrape all the drippings in the roasting pan into the smaller pot as well. You should have about 1/3 cup of fat in total. In the fat, add fresh green Sichuan peppercorns, dry red Sichuan peppercorns, ground white pepper and black pepper, and cook over medium heat until all the moisture in the drippings has evaporated and start to brown on the bottom of the pot. Whisk in the all-purose flour and cook for 30 seconds, then whisk in about 3 cups of the turkey broth to deglaze the pot. Don't worry if it's lumpy; it doesn't matter. Transfer the mixture into a blender along with the rest of the broth, and blend on high until smooth. Transfer back into the pot, add extra dark soy sauce until desired color, and cook until simmering and thickened. Re-season with fish sauce or salt if needed. After resting, the thermometer should read at the perfect internal temperature of 167 F/75 C. Remove the strings and skewers. 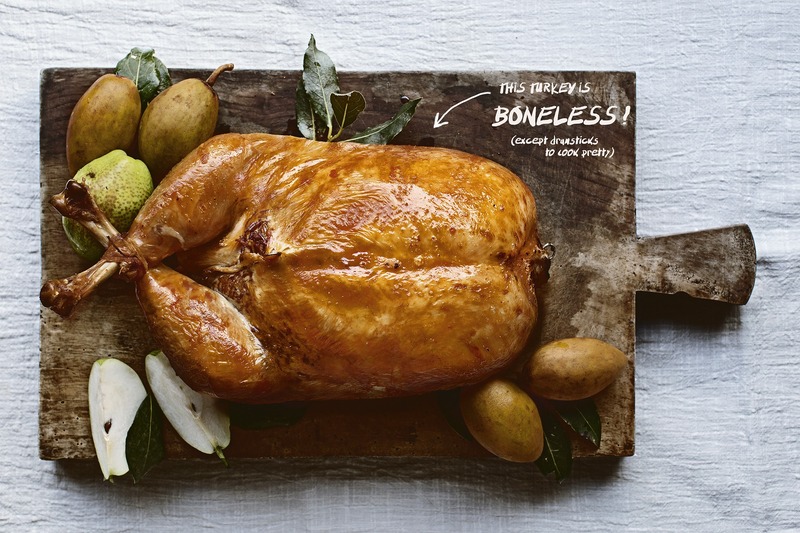 To cut the turkey, simply remove the drumsticks first, then cut the rest into perfect slices. Happy Thanksgiving. 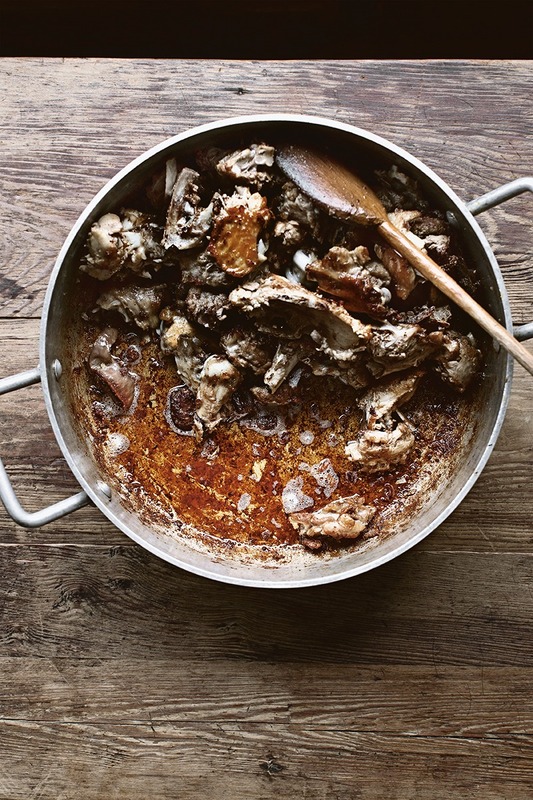 * Galangal powder is an Asian spice that pairs beautifully with poultries. It can be easily found online or in Chinese supermarkets, sometimes labeled as "ground ginger" (but it's different). If you can't find it, feel free to omit it, or replace it with your preference of spices. * Fresh green Sichuan peppercorns has an amazing, unparalleled floral aroma which makes it one of the backbones of Sichuan cuisines. But it can be hard to come by outside of China. If you can't find it, substitute with pickled green peppercorns. Start with 1 1/2 tbsp, and adjust more until the gravy is prominently peppery. Mandy, where do you find fresh green Sichuan peppercorns in Hong Kong? And by the way, thanks for the recipe and it sounds fantastic!! The steps seems quite sophisticated but totally wish to try it out!! I have talked to my mainlander colleagues and they suggested ordering from Taobao. As risky as it sounds, I am planning to try that out. That is a work of art, but the odds of me NOT f*cking it up are about exceedingly low. I would definitely have to this with a chicken first or a turkey, but not on Thanksgiving. You’ve inspired me to at least consider trying it since the final product SO looks worth the work. My mind is blown…why is this not a common thing? It makes total sense to do. Definitely trying it out this thanksgiving!!!! I love the way you write. I read the recipes just to find the next best phrase. Your descriptions are as savory as the recipes! The video is very helpful and I’m looking forward to trying the peppercorn sauce. Thanks for the recipe and the passionate and inspiring turn of phrase! THANK YOU, thank you, thank you for this. I’m going to try a smaller scale test with a chicken first to see how it works, If it goes the way I want it to, This is going to be so much less hassle for Thanksgiving & Yule. YAY! Mandy, would it be possible to do this with a goose or a duck? Would you recommend different temperatures or a different time in the oven? Thanks! Hey Mandy, is there any reason not to try this with a larger bird? Say 15-16 lbs? I dared my brother to make this for Thanksgiving. He said, “I can build a house and I can save a life, but I don’t think I can make a turkey purse.” I guess it is up to me. Hi Mandy, were those mandarin, kiwi and pear you were serving the bird with? Alexandra, it’s pear and another Asian fruit that I don’t know the name of lol. I shared your link with my mother and she used this technique with her own stuffing for Thanksgiving and it was reported to be a huge success! Thank you for a great idea!